We can help you stuff those stockings! Our Small Screen & Lens Cleaning Kit is a handy gift for the hunter, skier, snowboarder, photographer, stargazer or tablet user on your shopping list! Here's another great gift idea! Check out our brand new Multipurpose Microfiber Kit! Microfiber material cleans like no other! Absorbing liquid and removing hard to clean smudges like fingerprints; these cloths work great with your favorite cleaning solution, with water or alone! 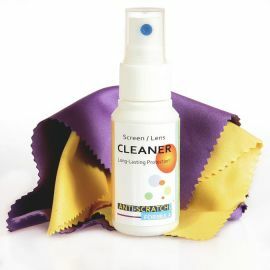 This kit offers different types of microfiber cloths to help with many different cleaning tasks! Hurry now and beat Santa to these awesome offers! Make sure you leave some carrots on the side of Santa's cookie plate for his reindeer! Have a wonderful holiday season everyone! I’m outta here for now! Thanks for reading! This entry was posted in Screen Cleaning and tagged Cleaners, Kits, Microfiber Cloths.